WATCH: Sheffield United loanee Jake Eastwood’s Harald Schumacher-style challenge in Sheffield FC’s derby against Stocksbridge Park Steels! Sheffield goalkeeper Jake Eastwood's challenge on Richard Stirrup that led to penalty shout. Peter Revitt’s sensational picture from Sheffield FC’s derby draw with Stocksbridge Park Steels adorns the front cover of our GrassRoots pull-out this week - but does it remind you of another famous goalkeeper’s challenge? Young stopper Jake Eastwood challenged Richard Stirrup on Easter Monday but Club’s appeals for a penalty were waved away, and the match finished 2-2. Eastwood certainly went for the ball, not the man but the picture does evoke memories of German goalkeeper Harald Schumacher’s challenge on Frenchman Patrick Battiston in the semi-final of the 1982 World Cup. 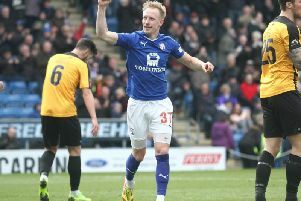 Eastwood, on loan from Sheffield United, has been in fine form for Club this season and has won their player of the month vote for the last two months. And see tomorrow’s Grass Roots for Paul Webster’s match report from the derby draw, inside your 16-page local sport pull-out in the Sheffield Star.